Describe in detail your work activities and how you used your grant funds this year. The first decision we made was to change one of the three farming partners in our study. Fresh Roots declined participation, so we added Hillside Homestead prior to beginning the project. In 2013 only 1,300 Blackbellies were registered with Barbados Blackbelly Sheep Consortium. After much discussion, we all agreed that assisting in the preservation and continuation of this breed would also be beneficial. Initially, our plan was to divide the sheep among the farms, but we felt that studying them in this fashion would not be as efficient, as it is more difficult to establish and monitor controls. It’s almost like 3 different studies. So we determined that moving the sheep together every 10-12 weeks would work best for the study. Soon after we selected a breed and made plans for purchase and delivery of our first batch of sheep (14 in 2014, 14 in 2015, 14 in 2016 – plus lambs produced), all 3 farms focused on infrastructure, building both permanent corrals and rotational grazing fencing. Each farm was able to install 1 acre pens with at least 1 acre of rotational grazing fence (polywire electrical, powered by solar panel and car battery back-up). Coyotes and an occasional black bear are an issue in Northern Michigan, so we took extra precautionary measures in our design. At New Mission Organics, we converted 1/4 acre of young vineyard into a permanent pen. We took the center two rows out and repositioned the posts around the perimeter. It was nice to be able to repurpose the posts and only have to drill half the post holes. We used rolled, galvanized steel fencing (48″ high by 330 feet long) for the perimeter and then topped it off with two loops of barbed wire. We ran an electric fence poly tape along the inside about a foot off the ground.The permanent pen has a small 14′ x 14′ shelter, constructed of black locust poles, 2″ x 6″ boards and steel siding. I added a couple of shade sails for a place to duck out of the sun. When the snow subsided and the ground sufficiently warmed up, we prepared our grazing areas with cover crops, using a perennial pasture and hopyard mix of oats, rye grass and white clover. The sheep were delivered to the first of our 3 farming partners, Delight of Life Farm in June. We purchased a registered ram and ewe, 9 wethers (castrated males) and 3 ewe lambs for $1600. Dorpers can run up to $300 each. The sheep spent the daylight hours outside in the rotational grazing pen and for their safety, ushered to the barn at night. We separated the ram from the female sheep and one of the older wethers kept him company. It took about 2 weeks for 14 sheep to devour 1 acre of cover crop. First lesson learned: at 2 weeks per acre, we all agreed that this throughput was not satisfactory for our needs. At New Mission Organics, we needed to cover ten acres twice between mid-July and the end of September. That equates to 3 to 4 times as many sheep as we had. So the first thing we did was decide to focus on 6 acres of hop yard instead of the full 10 acre farm. Next year we will plan to expand the herd faster, working our way up to 50 in 3 years. As soon as the hop plants were tall enough to be out of danger in early July (the sheep would eat the whole thing if less than 4 feet tall), the sheep were relocated to farm #2, New Mission Organics (for pictures and grazing, fencing details, see blog at www.michiganhopalliance.com). By the end of August, the sheep had neatly trimmed 2 of the six acres and were getting a good start on a 3rd. Sheep are very particular in how they graze. They prefer the water-logged early morning clover, so cover crop with fat leaves was eaten first. Then they pull the leaves off of the bottom 3 feet of hop plants and finally begin removing the weeds and tall grass in between the hop plants. 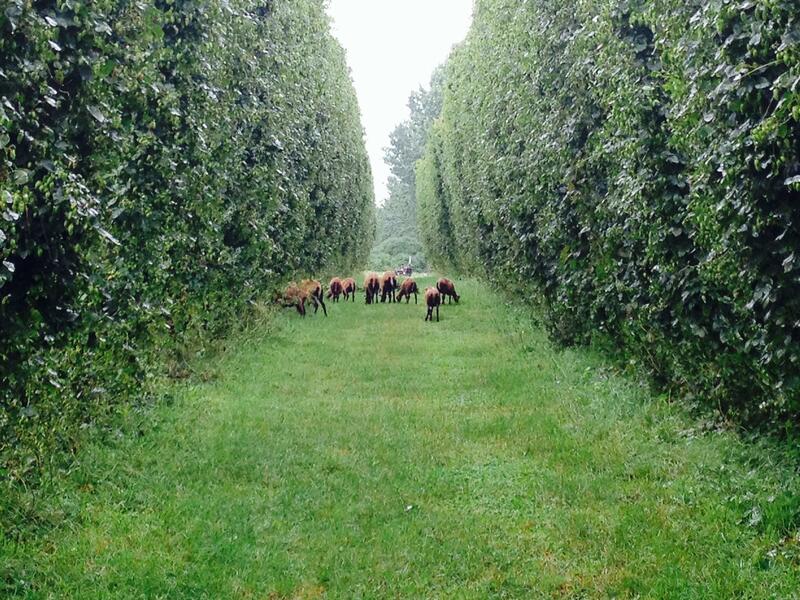 Based on the size of our hop yard and the way the sheep selectively graze, it would make more sense to place permanent fencing around the entire hop yard and let them freely move about, rather than work on 1 acre at a time. We think we would have better results and more thorough weed management coverage if the sheep could get after the weeds while they’re young. By restricting their movement to 1 acre at a time, the weeds in other sections got too tall and woody, so the sheep would avoid them until everything else had been eaten. There are 3 beneficial features to a sheep-trimmed row of hops: 1) by clearing the weeds and cover crop from around the root crown, more sunlight reaches the base of the plant, where energy can be used efficiently and mildew is held at bay. 2) we don’t know if all sheep are like this, but the BBB have cocoa puff sized feces that are broadcast to the ground in a very useful pattern, rather than pile. 3) by trimming the lower few feet of the plant, insects have further to climb to reach their target (good theft deterrent) and the plant concentrates its growing energy on the top two-thirds where the cones are located. Having the sheep in the hop yard surpassed our every expectation and I can happily attest that I hand-pulled about half the amount of weeds of previous years. All of this and they are a joy to have around. Win-win-win. In October, the sheep moved to farm #3, Hillside Homestead, a farm-stay B&B. In mid-November, they moved back to Delight of Life Farm, where they currently reside while we decide whether to sell, butcher or keep and breed them. It’s such a close call financially that the best option isn’t crystal clear. A factor that caught us by surprise was the price of hay for overwintering. We paid $5 per bale and sadly this was the going rate, not a shady deal. At 4 lbs per day (bales are 40 lbs), it will cost approximately $90 to overwinter each sheep. This may or may not be less than what it would cost to buy another sheep in the spring. It’s truly a gamble, because you can’t butcher a sheep that is more than 2 years old and expect to sell the meat to a restaurant. So the weeding and byproduct of soil fertility proposition has to be more beneficial than the meat production. This we know is true, because it costs us $1000 per day to hire a crew of 8 to weed one acre and we would need to do this 3 times in the growing season. Yes, there are conventional ways to deal with weeds, but we are not willing to put herbicides into our water table. We are certified organic and always intend to be. So let’s talk financials. Infrastructure not withstanding, 14 sheep were $1600.00, which is actually pretty cheap. We spent about $25/week on cracked corn, sweet grain mix and supplemental hay (June to October = 15 weeks). At the end of the season, the youngest sheep had not sized up enough to butcher at a hanging weight that would cover the initial investment of $125 (includes $150 transport cost), feeding cost of $27 and processing cost of $85. At $6-10/lb for restaurant lamb meat, a sheep would need at least 30 lbs of finished meat product to break even, before you consider any labor cost involved in caring for them and moving them around. Sheep lose about half of their live weight in the conversion to hanging weight (finished product). The BBB young lambs only achieved 70 lbs live weight at the end of the hop season. We can’t be certain at this point, but we suspect that this breed does not grow very fast. We will be experimenting and comparing another breed in 2015 to find one that has the characteristics we want (disease resistant, tame, mild meat, etc.) that sizes up faster. We will also supplement the feeding with more sweet grain mix. So we conclude that while we achieved excellent results in weed/pest management and our soil tests in the spring will no doubt support our prediction of beneficial soil fertility, the local protein source test is yet to be proven. Good thing this is a multi-year study. Potluck at 6pm, tour at 7pm. Get a snapshot of a farm other than your own and get a close up view of New Mission Organics’ new hoophouse, processing facility and how they’ve introduced sheep into the hopyard. New Mission Organics’ concentration is on hops and they supply to several breweries, but they’ve also had a few acres of hard cider apples, some cherry trees and a few hundred wine grapes. This is an opportunity for area small farmers to learn from one another’s practices through a series of twilight tours and farmer-led workshops. Farm tours are particularly valuable for beginning farmers as a way to build relationships, observe a wide variety of management styles and find support from a peer network. Upcoming twilight tours will have a unique theme, depending upon the farm. Following the tour will be plenty of time for Q&A. Free. Donations will go to the Small Farm Guild fund. For more information call 231-622-5252 or email jen@artmeetsearth.org. Twilight Tours #1-#8 will be found at www.ARTmeetsEARTH.org. 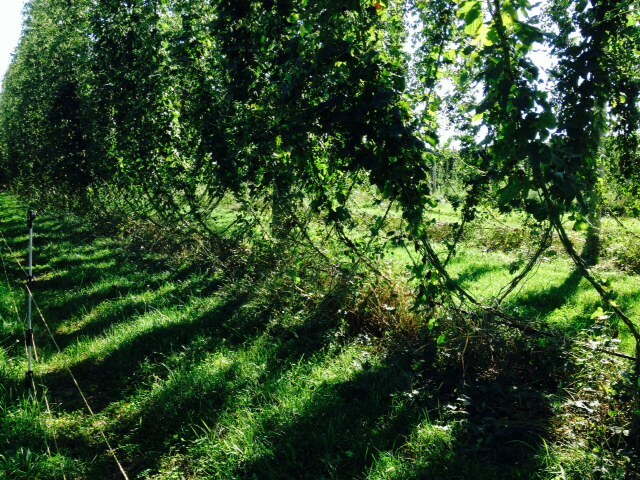 Michigan State University Extension will offer a Hops Field Day and Tour on Friday, August 5 from 8 am – 4pm. Participants will meet at the MSU Horticultural Research Station and travel to Doug Periard’s hop yard near Suttons Bay, New Mission Organic’s hop yard near Omena for tours and then to Empire Hops Farm for lunch and a tour of their processing operation, then return to the Research Station for lunch and research update, followed by an educational beer tasting led by local brewers. This field day is for hop growers and anyone interested in hops production and harvesting. The cost is $25 per person which includes lunch and transportation by charter bus. Some costs are being defrayed by a USDA OREI grant and the Michigan Restaurants Association. Pre-registration is required and space is limited. A registration form, due by July 29, can be obtained by calling the Leelanau MSU Extension office at 231-256-9888 or download a registration form online at www.msue.msu.edu/leelanau. For more information contact the Leelanau MSU Extension office at 231-256-9888. We also entertained visits from Michigan Brewers Guild, Bell’s Brewery and several other hop growers who are considering adding sheep to their farms.